That's most of the old "Assault on Black Reach" Warhammer 40K starter set. It's missing one of the rule books, some of the rulers and templates, two of the Ork Deffkoptas, and several of the Boyz, but it has 15 extra Space Wolves (plus a few extra Space Marines), and some (somewhat dry) paints, and a tub of Games Workshop "sand", which I hope no one spent too much on, but this is Games Workshop we're talking about so they probably did. 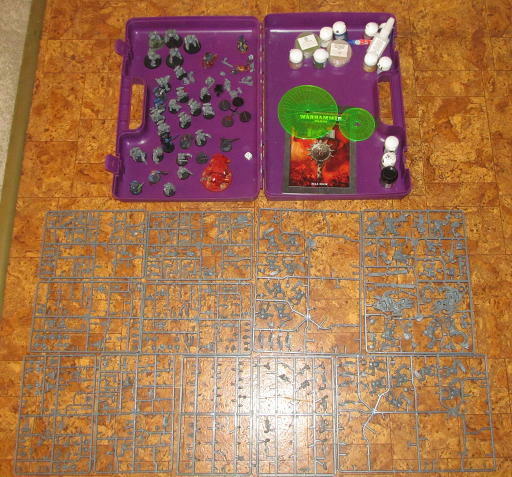 Even with the missing parts and in it's currently used and semi-painted state this is probably around $100 worth of stuff (or more since GW products are pretty overpriced here in Australia). I never would have bought them myself (like I said GW is overpriced), and I'm short one of the rule books (which I assume is the one that tells you the point costs of the included models, since the main rule book doesn't include that), but the main rule book is still there, and that should be enough to play the Kill Team from Heralds of Ruin, so that's what I'll probably do with these miniatures.